Special Notification: This weekend program has been cancelled. We apologize for any inconvenience. Je Tsongkhapa Day (Ganden Ngam Chö) is a celebration of the anniversary of Je Tsongkhapa’s parinirvana. It is celebrated on the 25th day of the 10th month in the Tibetan calendar. This year, Je Tsongkhapa Day falls on December 2. Demo Rinpoche presents a weekend of teachings based on Je Tsongkhapa's Spiritual Autobiography. Expressed through poetic verse, Je Tsongkhapa illustrates the path of his spiritual experiences and realizations and inspires us to consider it as a guide for own journey. Je Tsongkhapa (1357-1419) was a great fourteenth-century scholar and teacher who foun­ded the Gelug traditi­on. His many treatises finalized the work begun by Atisha which brought together the vast body of Indian scriptures and schools of practice into a unified exposition of the sutrayana and tantrayana paths. He wrote sever­al lam rims. The most well-known is The Great Treatise on the Stages of the Path of Enlightenment (Lam rim chen mo). There is also a medium-length lamrim text by Tsongkhapa (200 pages) and a short one, called Lam-rim Dü-dön (Tib. ), which is recited daily by many Gelugpas and is about ten pages long. Demo Rinpoche went to Drepung Loseling Monastery in Mundgod at the age of five and officially joined the monastery in 1987, where he spent nearly thirty years of uninterrupted education in meditation, debate, memorization, philosophy, and composition under the Dalai Lama’s direct supervision. 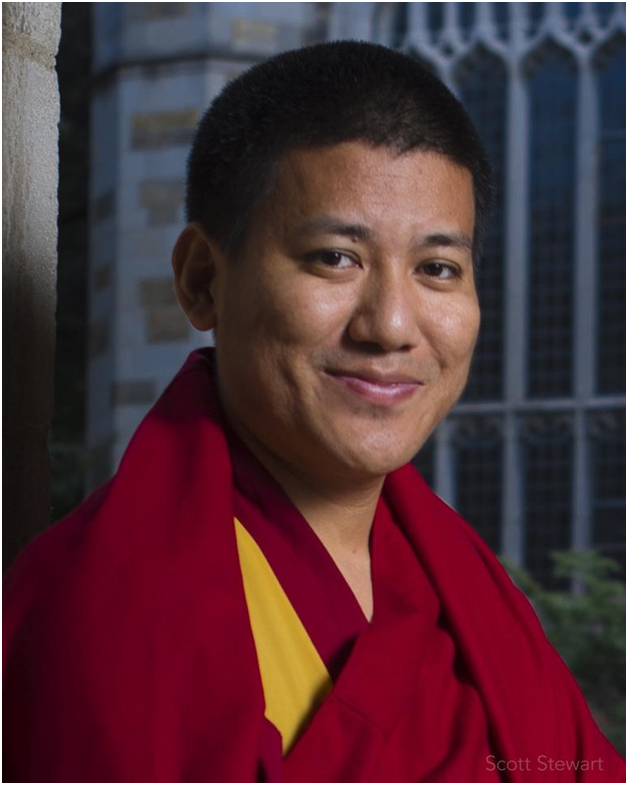 After completing his studies at Drepung, Rinpoche received the highest monastic degree of Geshe Lharampa from Gelugpa University in India in 2011. He continued his studies at Gyume Tantric College and was a visiting scholar under the auspices of the Dalai Lama at Sera College of Higher Tibetan Studies in Dharamsala. At the request of Gelek Rimpoche, Demo Rinpoche came to the United States where he received his Master’s Degree in Inter-Religious Engagement from Union Theological Seminary in New York City in 2018. Currently based out of Ann Arbor, Michigan, he serves as the Resident Spiritual Advisor at Jewel Heart.